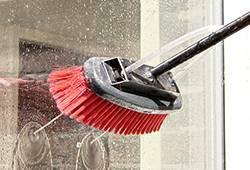 Perfect for cleaning at home or on the job, the MAXBLAST range of window cleaning equipment will keep everything from conservatory roofs to caravans gleaming. Forget carrying those ladders about on the job or going backwards and forwards filling up a bucket - our window cleaning systems have got everything you'll need to run a professional window cleaning business and keep everything sparkling at home. Telescopic poles can reach 20ft, 24ft and 30ft long, so you'll be able to clean windows, guttering and fascias, caravans, lorries and mini-buses. Whilst the water fed tanks and trolleys can hold between 16 and 30 litres of water, so you can have a constant supply of water right by your side. Whatever kind of cleaning you're up to, if it needs to be done fast then you can rely on our next working day delivery to mainland UK when ordered before 2pm.